President Obama might have a leg up on Twitter and 10 times as many Facebook fans, but there is one realm of the social network where Mitt Romney's campaign is possibly winning: Pinterest. 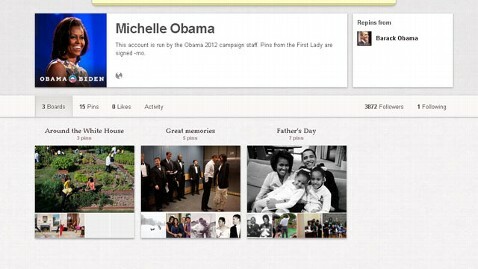 When first lady Michelle Obama debuted on the digital pin-board site this morning, her first "pin" came more than three months after Ann Romney tacked her first behind-the-campaign-scenes photo onto her newly minted Pinterest account back in February. Nearly 7,500 fans are now following Ann Romney's pins, which range from old family photos to the books she is reading. In the five hours since the first lady joined the latest and fastest-growing social site, more than 2,500 followers have signed on to follow her pins on the content-sharing service. By 3:30 p.m. ET her follower count had jumped to nearly 7,000. Obama's newly released book, "American Grown," is nowhere to be found on her new Pinterest page, nor are any of her notoriously healthy recipes. But while Obama is the campaign wife known for her healthy eating advocacy, Ann Romney's Pinterest page is the one brimming with healthy recipes. From low-fat turkey burgers to spaghetti squash, Romney seems to have a taste for the low-cal. Between the health-conscious repinned recipes are a few Romney-family concoctions such as Ann Romney's meatloaf cakes - "one of Mitt's favorites" - and her daughter-in-law's Butternut Squash Soup - "that our family loves." When President Obama debuted his Pinterest page in late March, the Obama family chili recipe was one of the first items posted on his page.